NIKKI NICOLE PHOTOGRAPHY: I Can't Stop Laughing! As my title of the post I cannot stop laughing at this photograph. It's of Rob at maybe the age of 2 or 3. Nobody seems to know how old he was here. HIs aunt's found this photo at their home and I am cracking up! 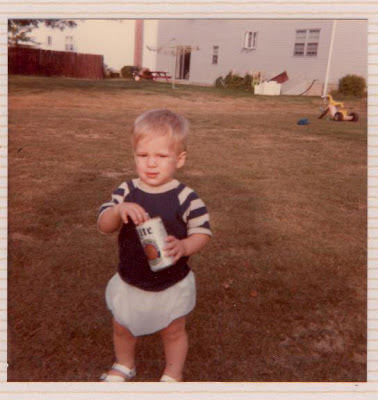 Who would of known that this photo would tell the future of Rob and the beer he drinks. That's right Rob loves good ole American beer Bud or Miller. HA! hahaha! too funny! that can is almost as big as he is!